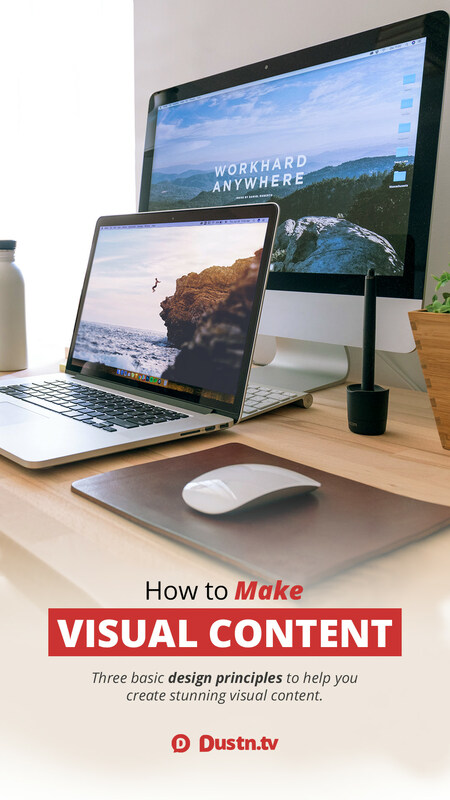 Three basic design principles to help you create stunning visual content. So you want to create awesome images that get attention and, more importantly, get shared? You’re not a designer though? Is that right? Well strap in, because you’re going to get a crash course in visual design without any fluff. Plain, simple, practical design principles to get you creating fast. I recently was the guest for #BufferChat where I was asked what the most important “design rules” to follow were. My answer was balance, framing, and contrast. 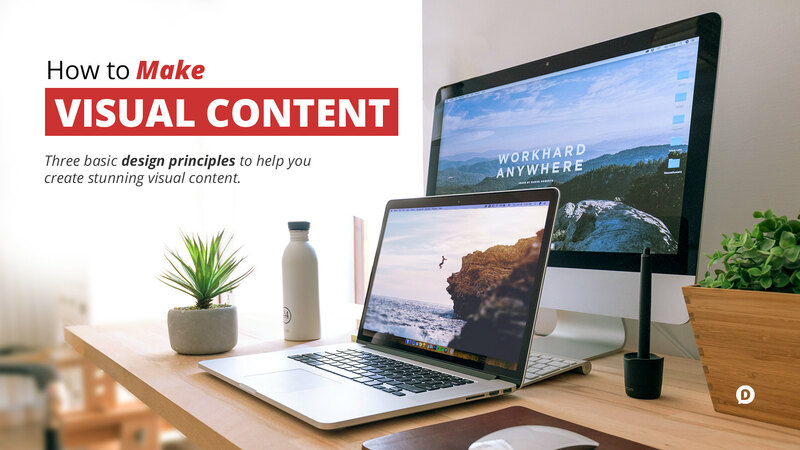 If you understand these three fundamental concepts you can create stunning visual content that people will love. Our brains are programmed to see symmetry as beauty. But when it comes to visual design both traditional symmetry and asymmetry can both be beautiful as long as a balance exists. Let’s apply this concept to creating social visual content. Assuming your background image/photo was obtained from a high-quality source (like the ones mentioned in my Best Places to Find Free Images), the photographer has probably already taken the time to balance out the shot. All you need to do is position your text and/or branding in a way that doesn’t unbalance the visual aesthetic. Start by imagining (or use a visual creation tool to impose) guidelines marking out where the center of the image is. Then you’ll be able to see where the subject or focal point of the image is and add your text in such a way as to balance it out. Okay, that one is pretty easy because the image is already perfectly symmetrical. So all you need to do is put your text in the center and call it a day. 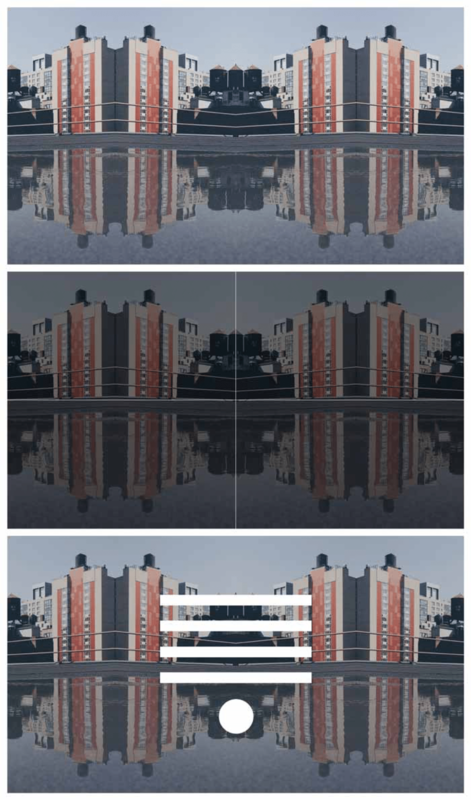 But what happens if your background image isn’t perfectly symmetrical? Asymmetry can be just as beautiful as symmetry as long as you balance it all out. Think of it like a set of scales. 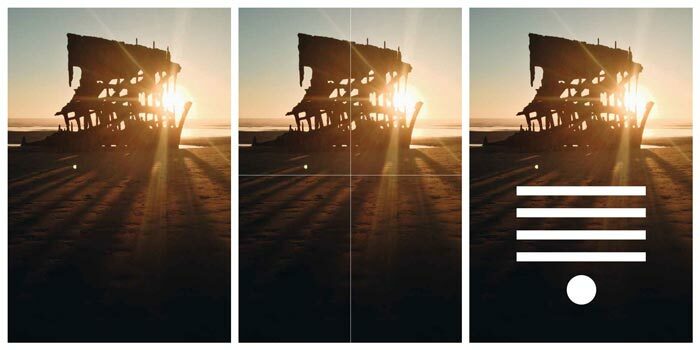 If the subject or focal point in the background photo are on the left side, then when you add your text you’ll want to put it on the right side. 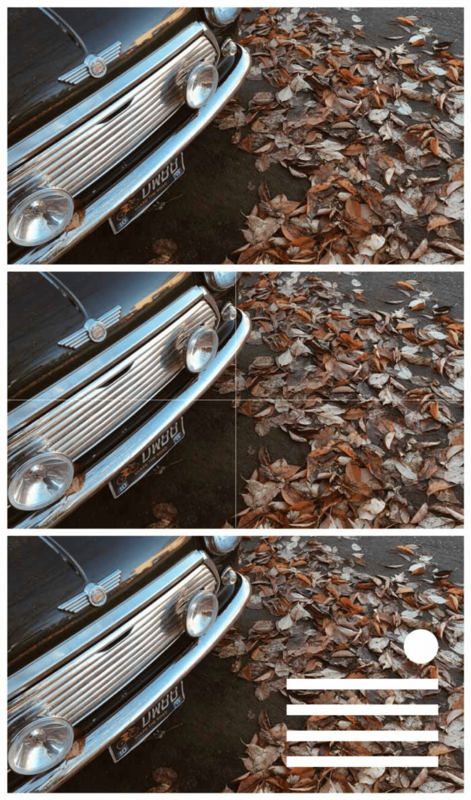 In the example above, you see that the car is the subject of this background photo. The subject covers the top-left portion of the image so to balance it out with our elements we put them in the bottom right. It doesn’t always have to be an exact science, but just remember to try and maintain the illusion of visual balance. If the image isn’t balanced it can give the impression of instability making the on-looker feel like something is wrong. If you’re trying to evoke a feeling of instability or something similar, then go ahead and throw balance out the window. But if you want your image to communicate beautifully, create visual balance between the photo/background and the text/logo elements. What I call framing is essentially creating an invisible frame around the outer most part of your image in which no elements are touching. Think of this as your non-negotiable white-space. In the image above I’ve made my framing area red so you can see how I’ve applied it to the templates you’ve already seen. Framing is especially important when you’re placing elements close to the edge of an image. If everything is in the middle you usually don’t need to worry. In order to process imagery, our brain immediately looks for structure— something we can grasp on to. If our brains can instantaneously identify the structure we can interpret what we’re seeing quicker and with more ease. This also ties back into balance. Consistent spacing of elements (or in other words, framing) displays a set structure. Notice how when you first see the image without the frame, your brain has already identified where the frame is. When you place text or watermarks too close to the edge (or right against the edge) of an image it feels constricting. For people who are claustrophobic (or overly OCD designers like myself), it can cause tension. When the framing is inconsistent it can also throw off the balance which takes us back to square one. Contrast is most easily explained as the difference between two or more things. 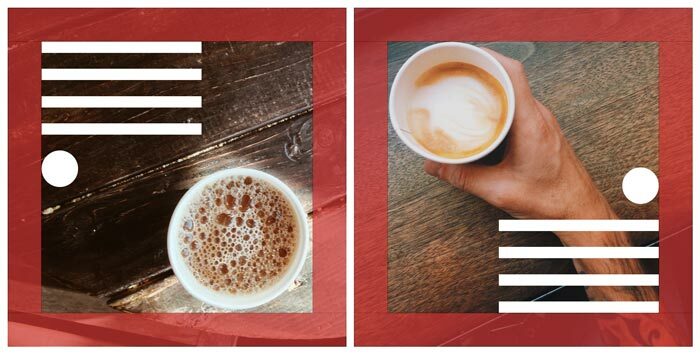 When it comes to visuals, we’re talking about the visual distinction between the background and the subject matter. The closer the two elements are to blending in, the lower the contrast. The lower the contrast, the harder they are to distinguish. In the context of visual content and social media images your goal is to communicate a message. If that message is difficult to read, you’re shooting yourself in the foot. When working with photo backgrounds though, it can sometimes be easy to accidentally position your text in a way that makes it difficult to read. Before finalizing your images always be sure that they’re fully readable. You may need to play with the text color a bit or even move the text around to ensure it doesn’t disappear into the background. Bonus tip: One of the easiest ways to create good contrast is to add a semi-transparent layer of black (or any dark color) between the background image and text. If you manage to create an image with balance, framing and good contrast then your message will not only be effective, but beautiful as well. As always, practice makes perfect so give it a go. Have some fun. Use one of my recommended mobile apps for visual content or one of the desktop apps that I’ve recommended as well. In the comments below, share some visual content pieces you’ve created! You can leave a comment by clicking here. 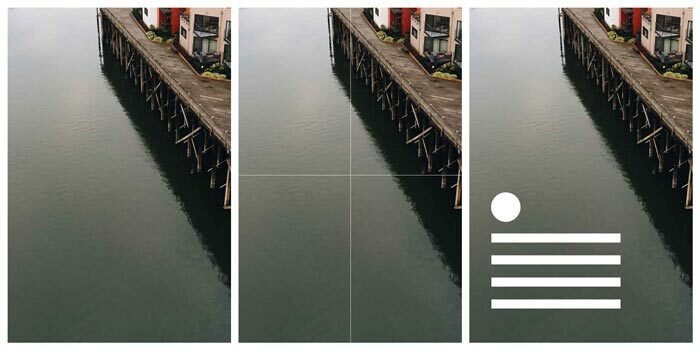 This is a great post about visual content design. I love your post so much and many many thanks for sharing with us. Gah! Thank you! I recently changed up the title for some SEO split-testing and didn’t catch that. What I’m mostly talking about here is visuals that have text and/or CTA elements. And these principles are the basis for good visual design, regardless of whether it’s casual or not. So if you’re just posting a plain image, then I guess these rules wouldn’t apply. Great tips Dustin, It’s like magic mantra for visual & graphic designers. 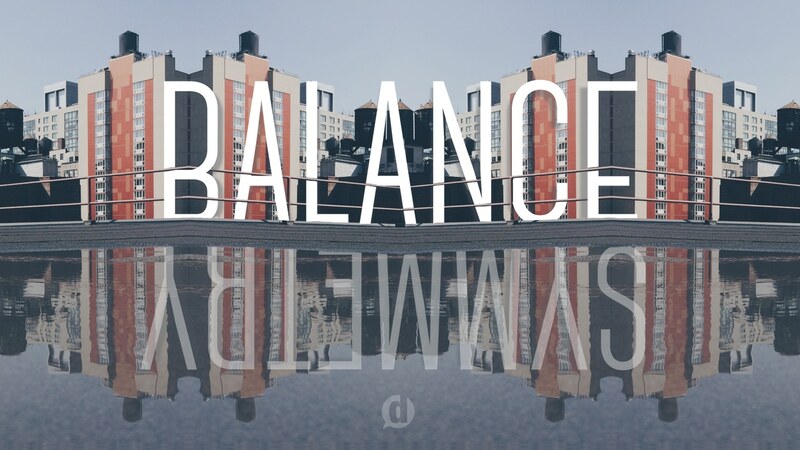 You have explained “Balance, Framing and Contrast” is super cool way with perfect example. The people with artistic background certainly have ideas of all these techniques, but for a designer, who doesn’t have any art background will be benefitted from your post. Thanks a lot. Keep it up. Glad you liked it Harry! What are you working on where you’ll be applying these principles? Thanks for sharing these simple but important aspects of design in a way that most anyone can understand! Thank you for this, especially that tip of a semi-transparent dark layer! I have started as a digital marketing manager with a small start up, and am expected to use my knowledge from college and I alone am the entire marketing department, so there is plenty of pressure. This has helped a lot! Thanks! Great tips Dustin! This is going to help me out so much since I’m still trying to create a logo for my blog Chictales.com. Awesome Ina! You may want to check out my post on Choosing Your Brand Colors. I haven’t yet written a post about logo design, but I have a loose idea drafted for it. Awesome! Very Helpful and clear! Bookmarked this post. I struggle sometimes with balance so your tip on breaking up the image really helps. 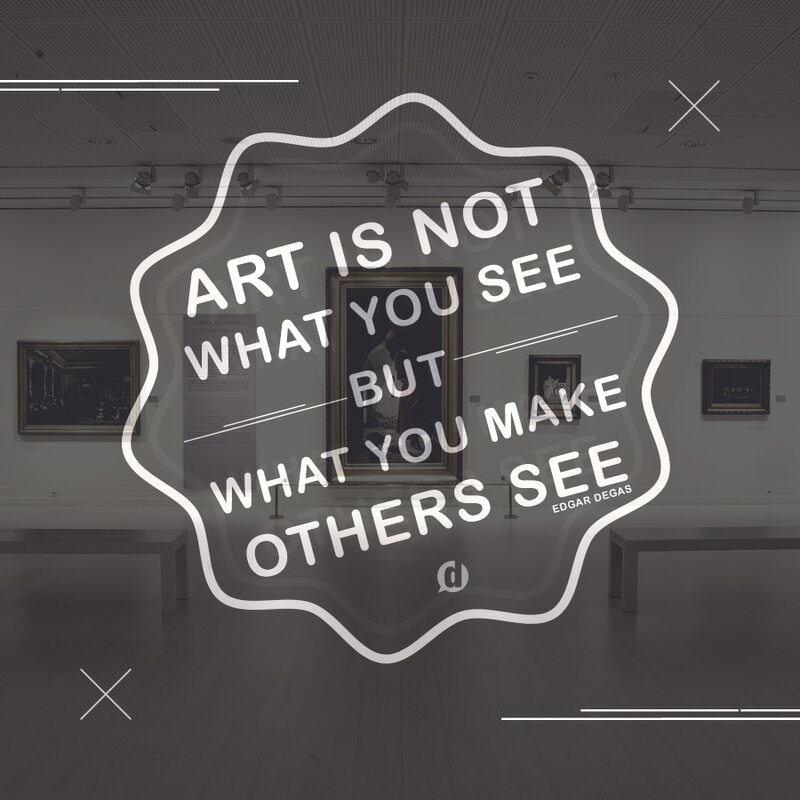 In the hangout, you talked about if the text is still hard to see on the image, to use a brown or black semi-transparent layer over an image then add the text over it. I sometimes use a semi-transparent shape over the background which doesn’t cover the whole image. Wha’s your opinion? Should the transparent layer be over the entire image so it wouldn’t be distracting to the eye? I think that works great Brown! Shapes are a great way to frame the text to further separate it from the background. Thanks Dustin for your help. You cleared that up for me. Dustin, this may be beyond the scope of your great article and I’m no designer, but I have been playing with perspective and using GIMP to create some designs. On this particular image, i attempted to make the text look like it was painted on the street. What is your opinion of it? Thanks for commenting Steve! My first thought– I would miss it if I weren’t looking for it. 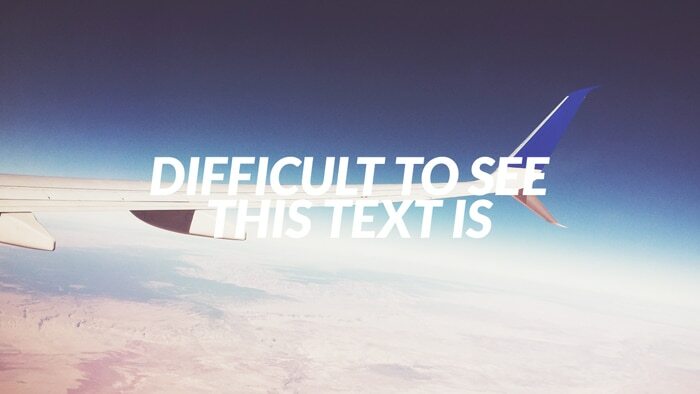 When I did find it, I couldn’t read it because the contrast is too low and the letters are too squished together. Make the text white and see if that works better. If you look at the street area around the text, everything else painted on the ground is painted in white anyways, so it makes more sense. Regarding contrast, the white text on a red background has very good contrast, but black/white still provides the *best* contrast. Some people with color blindness will see the red more as brown. We can’t forget the people who have trouble seeing color. Absolutely right Ty! 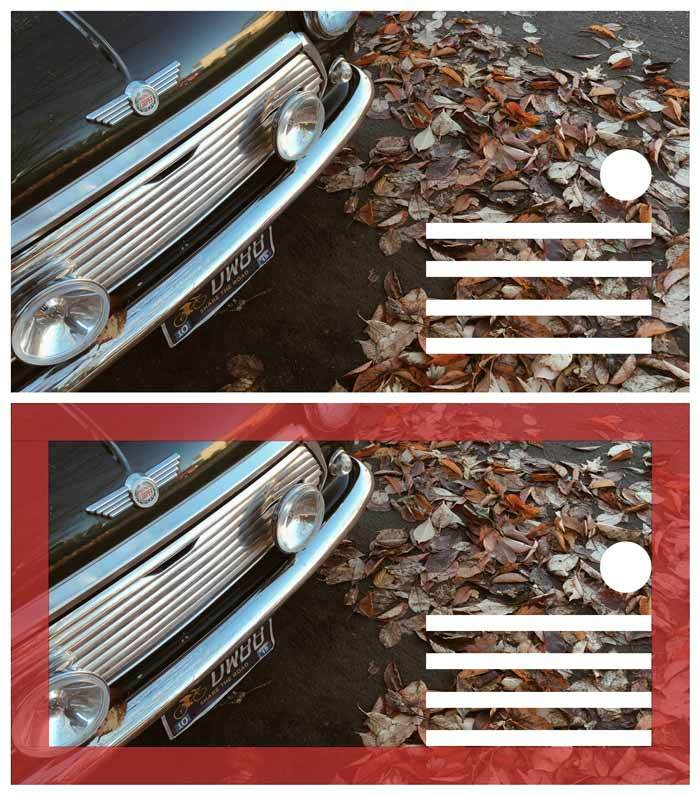 I will sometimes (time allowing) run images through this color blindness simulator. Do you use anything similar? I loved your section on balance-it made so much sense to me and will influence my “creations” in future. Thanks so much. Really great slideshare Laura! Loved it! Great tips and very easy to read Dustin. The visuals are great! Thank you Renee! So glad you liked it! thanks for this post, it’s really put a lot into perspective for me. Can’t wait to read more on this topic. This is where I struggle most. Awesome Greg! Glad this was helpful for you! Simple and efficient with illustrative examples. Way to go. Merci. I’m a content marketer and usually need images for blog posts which mostly include those taken from the net. This is more than a handy guide to not only work with the existing photos but create original ones too. I’m glad you liked it Mohammad! You may also like to read my Best Places to Find Free Images & Photos Online post if you haven’t already read it. Yes Dustin. I have gone through almost entire “Creativity” section of your site. You create wonderful content. Very helpful tips Dustin. I am a small city entrepreneur and you know, being a bootstrapped entrepreneur, it is not always possible to go to a designer. I learned web designing using internet but as we all know creativity can’t be taught and I seriously lack on that part. Awesome Soumya! Growing up in a small town, I have a lot of respect for small town entrepreneurs. Always keep learning my friend! And I think creativity can be taught, but it’s much easier to be grown like a muscle. Practicing and practicing. Seriously, this is really helpful information. A lot of what you describe is almost instinctual – someone with a decent eye will be able to grasp the concepts even without having words to describe why they’re making certain design decisions – but it’s really great to have the terms defined and described for the non-designers. I’m definitely adding you to my must-read list! Haha Krista! I don’t know if all designers use those terms, but they’re definitely the ones I use because they seem to make sense to those I try to explain them to. I’m so glad you found it helpful! I intentionally crafted this post so that it was both easy and actionable. You’re absolutely right about the instinctual aspect. For a professional artist or designer, these things are common sense and usually taken for granted. But to be able to articulate these fundamentals to clients or students is an essential part of a designer’s skillset. Most designers though, since they take this stuff for granted, can’t properly articulate them. I agree, Krista. For someone who is artistic these tips are probably instinctive. I also found Dustin’s post helpful. I’m analytic and a nerd. ha! These tips will help when I’m putting text or a logo on an image. Thanks Dustin, you did a good job of communicating artistic concepts with practical tips. I’m so glad you found it useful Rob! Rock on! Great tips Dustin! A lot of these tips can apply to producing great video as well. Definitely bookmarking this one! Thanks Jeff! And you’re absolutely right– videography, photography, and graphic design have a lot of crossover when it comes to fundamental principles.